Emergency Laparoscopic Colorectal Surgery – Is the Pain Worth the Gain? Introduction: With the increasing experience of surgeons and technical advances, laparoscopic colorectal surgery is finding its place in the emergency setting. 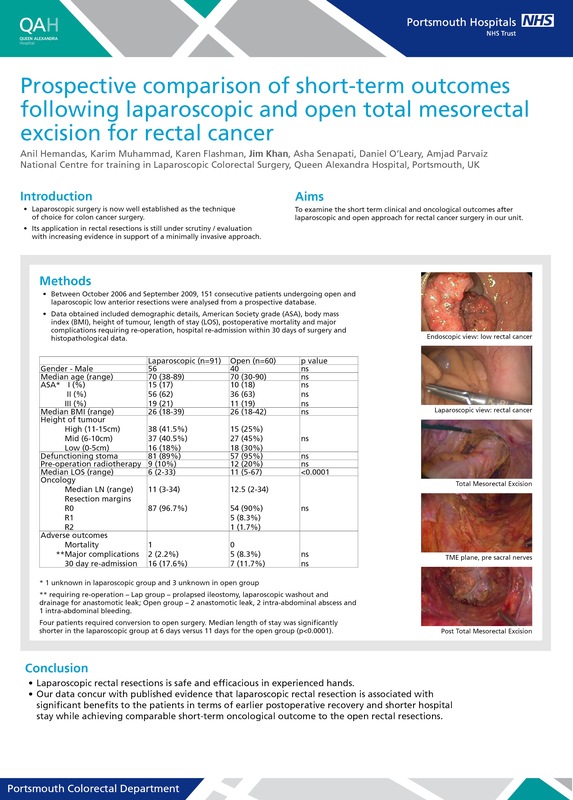 The aim of this study was to analyse the feasibility and clinical outcome of emergency laparoscopic colorectal surgery. Methods: A prospectively collected database of all laparoscopic colorectal procedures between January 2008 to August 2009 has been used to identify patients who underwent emergency laparoscopic colorectal surgery. This group has been compared with another cohort of patients who had elective laparoscopic colorectal surgery during the same time period. Conclusions: Laparoscopic colorectal surgery in an emergency setting is feasible and associated with acceptable morbidity and mortality. The short-term clinical outcomes are comparable to elective surgery.